The figures of Grief and History stand atop the Peace Statue near the U.S. Capitol, Jan. 20, 2018. President Donald Trump and the U.S. Congress failed to reach a deal on funding federal agencies in Washington. Blaming each other for the political deadlock, Republican and Democratic lawmakers closed the first day of a partial shutdown of the U.S. government with few signs of agreement on a spending bill tangled in a fight over immigration. Senate Majority Leader Mitch McConnell said Saturday night he had scheduled a vote for 1 a.m. Monday on a new spending bill that would keep the government open until Feb. 8. The vote puts pressure on Senate Democrats to reach an agreement or risk voting down a government spending bill for the second time. Spending authority expired at midnight Washington time Friday, triggering a halt of non-essential functions. 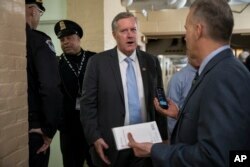 Rep. Mark Meadows, R-N.C., chairman of the conservative Freedom Caucus, left, joined by House Armed Services Committee Chairman Mac Thornberry, R-Texas, center, and Rep. Lamar Smith, R-Texas, arrives for a meeting of fellow Republicans on the first morning of a government shutdown, at the Capitol in Washington, Jan. 20, 2018. House Minority Leader Nancy Pelosi, D-Calif., center, speaks at a news conference, joined by, from left, Minority Whip Steny Hoyer, D-Md., and Rep. Joseph Crowley, D-N.Y., on the first morning of a government shutdown, at the Capitol in Washington, Jan. 20, 2018. Senators marked the first day of the shutdown shuttling back and forth among each others’ offices in the hopes of hammering out a deal. The U.S. House of Representatives stayed in session Saturday, voting on a rule that would allow the body to quickly consider any newly negotiated legislation sent over from the Senate. The House was set to return to work Sunday in the event the Senate reached a compromise. 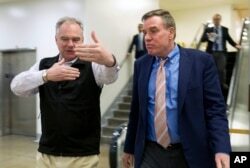 Sen. Tim Kaine, D-Va., speaks with Sen. Mark Warner, D-Va., as they walk to their offices Jan. 20, 2018, on Capitol Hill in Washington. 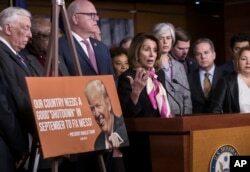 Republicans and Democrats showed no signs of ending their standoff over immigration and spending Saturday as Americans awoke to the first day of a government shutdown and Congress staged a weekend session to show voters it was trying to resolve the stalemate. The White House and Congressional Republicans blamed Democrats for what it called the “Schumer Shutdown,” accusing legislators of valuing illegal immigrants ahead of lawful Americans. “Mr. Schumer is going to have to up his game a little bit and be a little bit more honest with the president of the United States if we’re going to see progress on that front,” OMB Director Mick Mulvaney said in a White House briefing Saturday afternoon. 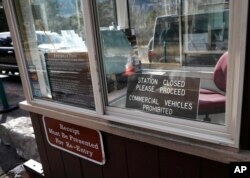 Vehicles pass by freely in the background as a fee booth sits unmanned at the east entrance to Rocky Mountain National Park, in Estes Park, Colo., Jan. 20, 2018. National parks are to remain as "accessible as possible" during a government shutdown that began Jan. 20. What stops and what continues during a federal shutdown varies, but federal research projects could be stalled, national parks closed, tax refunds delayed, processing of veterans’ disability applications delayed, and federal nutrition programs suspended, as was the case in 2013.